In the traditional application model, services are tightly coupled with the processes they support.F or example, whenever a server’s process changes, existing clients using that process must also be updated. 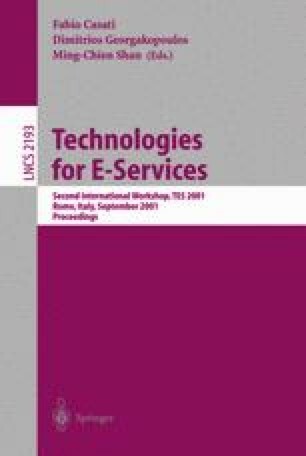 However, electronic commerce is moving toward e-service based interactions, where corporate enterprises use e-services to interact with each other dynamically, and a service in one enterprise could spontaneously decide to engage a service fronted by another enterprise.W e clarify here the relationship between currently developing standards such as UDDI, WSDL, and WSCL, and propose a conversation controller mechanism that leverages such standards to direct services in their conversations. We can thus treat services as pools of methods, independent of the conversations they support.E ven method names can be decided on independently of the conversations.Se rvices can spontaneously discover each other and then engage in complicated interactions without the services themselves having to explicitly support conversational logic.T he dynamism and flexibility enabled by this decoupling is the essential difference between applications offered over the web and e-services.